The record-setting 74th series of Marvel Minimates is one for the ages, and it's only available at comic shops and specialty stores! Spanning four different storylines from Marvel's history, this assortment of four two-packs captures four of the greatest Avengers in four of their most epic battles, with four new outfits and four never-before-made opponents! From the "Surtur Saga," Ages of Thunder Thor takes on the first-ever Surtur Minimate! From "Planet Hulk," King Hulk takes on the first-ever Red King! From "Old Man Logan," Logan takes on the never-made Ashley Barton Spider-Girl! And from "Secret Empire," Agent of Hydra Captain America takes on the all-new Ironheart! 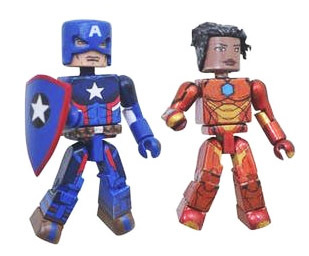 Each 2" Minimates mini-figure features up to 14 points of articulation, as well as fully interchangeable parts! Each 2-pack comes packaged in a full-color window box. "This is one of those series that has something for everyone - a mix of classic/modern and new characters/costumes. Surtur is a long requested Thor villain, and if you don't remember the Red King, you should read Planet Hulk again - it is an amazing story, and I am very glad we are getting him as a Minimate."